Karwa Chauth 2018 Puja Muhurat & Moon Rising Time: Karva Chauth is an important Hindu festival especially for women. Married ladies observed it with fasting and doing pooja as well as follows traditional customs for the day. This year, it falls on 28th October. However, the exact time will depend on the moon rise. The meaning of the name of the festival can be understood with this. ‘Karwa’ means pot and ‘Chauth’ means the fourth. Thus, it is celebrated on the fourth day of Kartik month of Hindu lunisolar calendar. Married women exchange pots with each other. They pray for the well-being and longevity of their husbands. On this day, married women start fast from the sunrise and continue until moonrise. The fast is broken when the ladies see the moon through the sieve and then their husbands. Then, spouses offer their wives water and sweets. After that, they have their dinner plans either at home with everybody else or somewhat else. Share: Karwa Chauth Messages. This festival in not just meant for married women; rather it can be observed by the unmarried girls who are approaching the marriage age and wants the desired husbands. It is popular in Indian states like Madhya Pradesh, Delhi, Rajasthan, Punjab, Haryana, Himachal Pradesh, Uttar Pradesh, and some parts of Bihar. Check: Karva Chauth Images. Apart from the food, women dress in traditional attires. They chose bright and colorful ethnic wear similar to bridal wear. Also, they apply mehndi on their hands and legs. There are numerous mehndi designs available on the earth. Some vary with the regions. However, in this era, nothing is away with the help of the internet. The Vana Parva of Mahabharata tells the origin of this Karva Chauth festival. It says that on this occasion, Savitri begged Yama (the god of Death) for her husband’s soul. 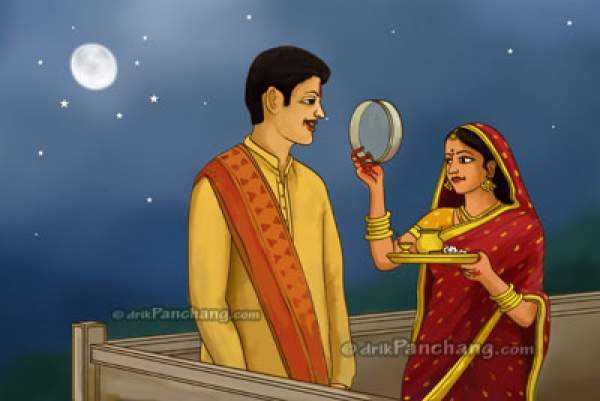 Karva Chauth marks the beginning of the Rabi crop-cycle or wheat-sowing time. Some say that people started observing the day for a good harvest season. Well, that may be the reason why it is most popular in mostly agriculture dependent regions like western UP, Rajasthan, Maharashtra. On October 19, the ‘shubh mahurat’ (auspicious time) for the Karva Chauth puja starts from 5:43 am to 6:50 pm. We have listed the moon sightings timing for the various cities of India below. Check it out. Offering prayers to the moon after the moonrise and before eating something to break the fast is an important part of the ritual. People also worship God Shiva, Ganesha, Kartikeya, and Goddess Parvati at this time. Moreover, women offer earthen pots containing rice and urad dal to their mothers-in-law. The list of moonrise time is as follows. Hope you got the Karwa Chauth 2018 Puja Muhurat & Moon Rising Time. If there is any fluctuation, it will be updated timely.